Sarasota County achieved a “dramatic improvement” in the diversity of employees it hired in 2016, according to a report provided to the County Commission. And while the county recently lost one African-American assistant administrator to another community, it appears Sarasota County Government will be keeping a second one whose future in Sarasota was in question. 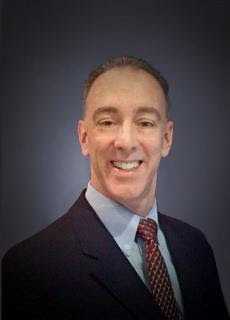 The Tampa Bay Times reported on March 14 that the Pasco County Commission unanimously had chosen Dan Biles of Alabama as its top choice to be the new administrator. 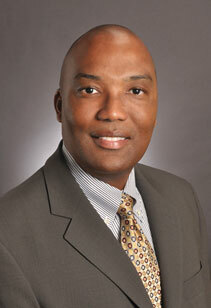 Assistant Sarasota County Administrator Mark Cunningham was one of the finalists for that position. Just prior to her stepping down from the County Commission in November 2016 because of term limits, Commissioner Carolyn Mason criticized County Administrator Tom Harmer for naming Assistant County Administrator Steve Botelho the new deputy county administrator. Botelho, who also is the county’s chief financial management officer, is white. In the latest report from the county’s Human Resources Department — dated Jan. 18 — Director Chris Louria wrote that data showed 12.3% of the new hires in 2016 were African-American, an increase of 3.5% compared to the 2015 figure. Additionally, 9.4% of the new employees in 2016 were Hispanic or Latino, compared to 8.8% in 2015, the research showed. The hiring of women also improved last year, Louria’s report said, climbing 4.4% over the figure for 2015. 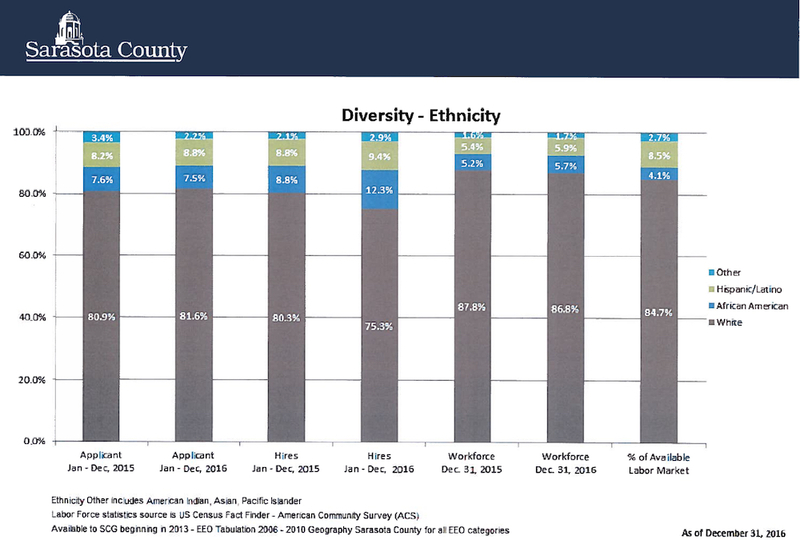 Altogether, the summary noted, 24.6% of all county hires in 2016 were diverse candidates, up from 19.7% in 2015. The update to the commission was based on data as of Dec. 31, 2016, the report shows. Using 2010 U.S. Census data — the most recent available — the Human Resources Department staff provided further statistics. With a population of 379,748, the research showed, Sarasota County had 168,435 people — 44% of the total — comprising the available workforce. Of those potential employees, 4.1% (6,920) were African-American; 8.5% (14,195) were Hispanic; 84.7% (142,731) were white; and the remaining 2.7% (4,589) represented other races, the report noted. Women comprised 48% of the available workforce, the research showed: 80,580. The Jan. 18 report included other breakdowns, as well, comparing 2015 and 2016 figures. At the end of 2015, the report said, 87.8% of county employees were white; that dropped to 86.8% as of Dec. 31, 2016. On Dec. 31, 2015, 5.2% of county workers were African-American, and 5.4% were Hispanic or Latino. At the end of 2016, 5.7% of county employees were African-American, while 5.9% were Hispanic or Latino. Of the remaining personnel 86.8% white and 1.7% represented other races, including Native Americans, Asians and Pacific Islanders, the report said. In regard to gender diversity: In 2015, 41.3% of all applicants were women; in 2016, the figure was 41.7%, the report notes. In 2015, 69% of all hires were male; in 2016, that dropped to 64.6%. However, as of Dec. 31, 2016, 70.1% of the total county workforce comprised males, a increase of 0.2% from 2015, when the figure was 69.9%, the report noted. The memo accompanying the data also noted, “We held a successful job fair at Selby Library” on Jan. 10, and staff was preparing to attend a training session in Gainesville on Jan. 27. The theme for the latter program was Diversity and Inclusion: 21st Century Challenges and Case Studies.